“I am going to get xenophobic here: we garden rather well. I am tempted to say we garden second to none . . . English gardens do not wear a straitjacket; they are lush, exuberant, expansive . . . We have an immediate advantage: the climate. The temperate climate that means plenty of rain for those lawns, and for everything else, few prolonged extremes of either cold or heat, a long growing period.” LIFE IN THE GARDEN (Viking 2017). Climate change is real and affects us all. I’m finding it increasingly difficult to perform simple summer garden tasks in the suffocating heat. And temperature extremes exact a brutal toll on the plants. Oxydendrum arboreum (Sourwood) Z 5-9, is a deciduous, native tree, with multi-seasons of interest. In summer it produces cascading sprays of tiny, urn-shape, fragrant white flowers, beloved by bees. 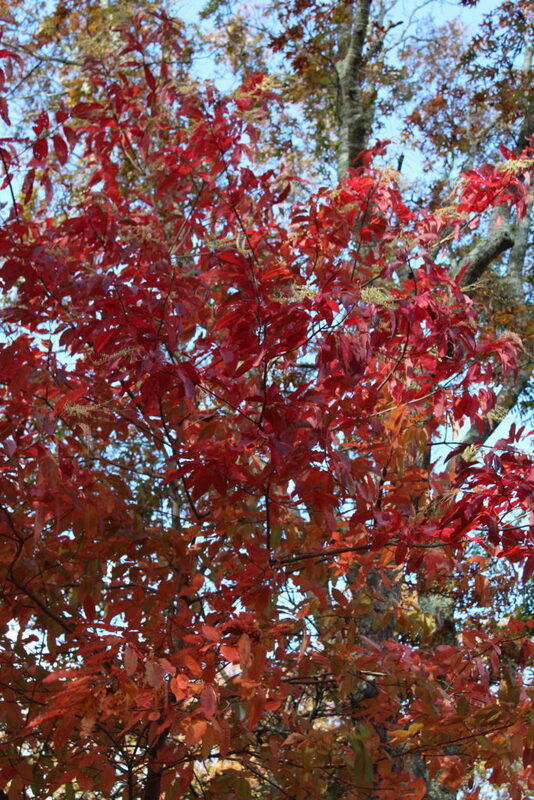 The lustrous, dark green leaves turn vibrant shades of red in Autumn. After twenty years my tree is about 25 feet tall. Photos below. Provide acid, moist, well-drained soil, rich in organic matter. The tree does well in sun or part-shade. Here it receives only a few hours of filtered sun, yet is a reliable bloomer. Thus far, my Sourwood has been pest and disease free and immune to Mother Nature’s insults. A fabulous, easy-care, specimen tree. I’m also quite taken with the striking, unusual, Asian native deciduous tree, Firmiana simplex (Chinese Parasol Tree) Z 7-9. 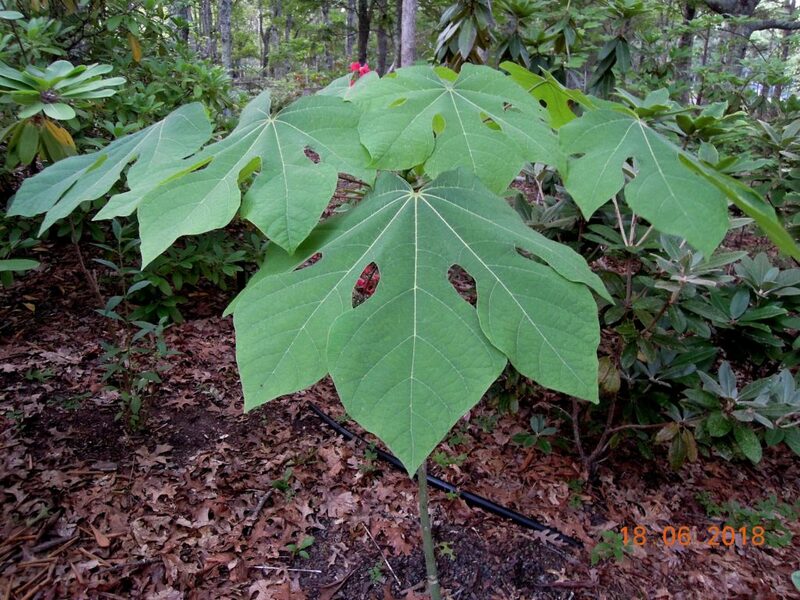 The Parasol Tree is a stand-out with enormous, tropical-like leaves and green bark. Photo below. It blooms in summer with clusters of small yellow-green flowers on showy, long panicles at the ends of branches. 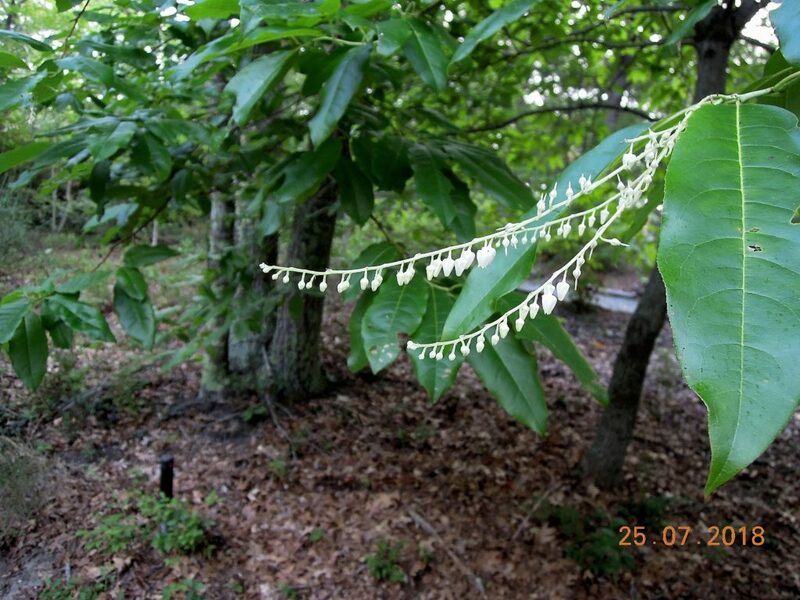 When the flowers age and produce seed in late summer, the tree reveals the reason for its common name: the papery seed-covers separate and drape over the seeds like tiny umbrellas (parasols). Chinese Parasol Trees can be successfully grown in a variety of soils and in sun or shade. Mine has been healthy for 10 years in acid soil and in shade. But it has never bloomed. Moreover, while Firmiana can attain a height of 40 feet my tree is only about 3 feet and doesn’t seem inclined to grow any higher. Methinks it needs sun for growth and bloom. Act accordingly if you are into tall and parasols. One more thing: It is believed that the mythical Chinese Phoenix Bird, feng huang, perches on the Firmiana tree.This extraordinary bird symbolizes unity and harmony — male-female, yin-yang — as well as goodness and justice. And it sings like an angel. Provide the perch and the bird may come. This entry was posted on August 2, 2018, in Autumn Fruit and Color, Flowering Trees, Fragrant Plants, Garden Books, Hot Tips, Native Plants, Organic Gardening, Shade Gardening, Trees and Shrubs. Bookmark the permalink.